Dow Chemical, the owner of Union Carbide, key accused (under both criminal and civil law) in the 1984 Bhopal gas disaster, is attempting to recruit IIT-Madras students. Since Union Carbide has not even responded to a summons in the criminal case, Dow Chemical is guilty of shielding a criminally absconding corporation. Besides, Dow Chemical refuses to clean up the severe contamination present at the factory site which causes interminable suffering to the gas survivors and their offspring even today. This is a petition to IIT-Madras to refuse campus recruitment to Dow Chemical. Indeed, it is part of a larger campaign to petition IIT-Madras to screen the corporations it allows for campus recruitment in order to disallow criminal corporations. Please also write to the members of the IIT-Madras Senate which consists of the Faculty and is the main decision-making body. The list of professors on the Senate is available here. Center may give a “green” signal to Dow Chemicals? would not be happening if chemical companies can get beyond their bottom line…it’s time to hold them accountable for the disease and suffering they cause all around them. If I walked into Beverly hills and caused the same effect that they did in Bhopal…would I be in jail the same day? 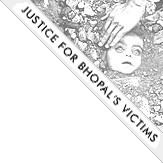 The Bhopal legacy is also a story of the insignificance that the Western world has shown for the developing and the under-developed countries. It shocks me to even think that individuals responsible for this genocide roam free till date. just stopping them from recruiting our young-minds at IIT won’t suffice, we’ll have to hold them accountable for the mass-murders in Bhopal-1984! Any bright-ideas coming up, guys? We definitely need to hold them accountable. I am sure my IIT brethren down south fully understand what is right and what is wrong and will never be a part of a criminal corporate house. As for Dow, it should have been already kicked out of the country…for not caring for or respecting this country. Down with Dow.